Final week in my first village. November 20-25, 2018. 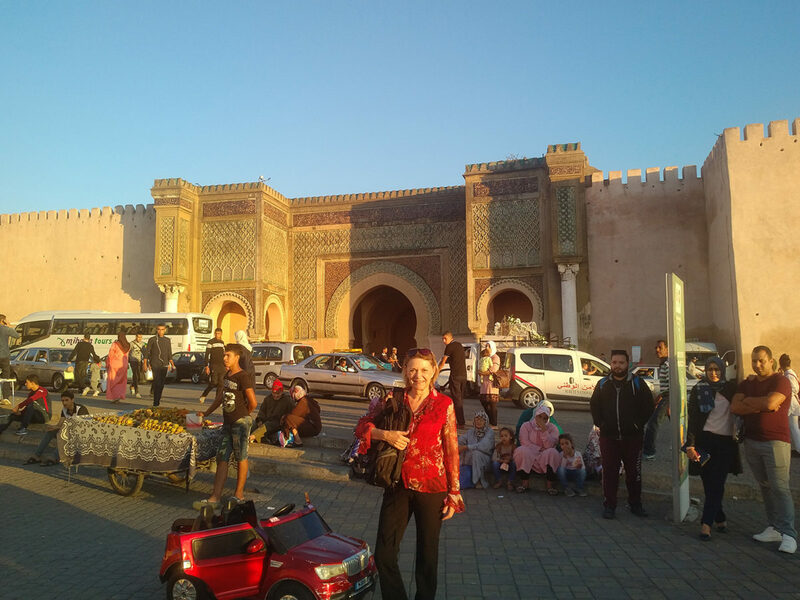 In this final week I want to describe the Moroccan holiday, my final Language Proficiency Interview, my Thanksgiving, final class projects and farewells. The Prophet Mohammed’s birthday is a big holiday here, but it looks a lot like every day. This is because we eat party-size food all the time. Meals can be drawn out by multiple courses, but there is no lingering before or after, as the dining space is small. The night before, Mama and I baked a cake and a ton of cookies. You may recall that before the wedding I had the job of grinding rocks into powdered sugar. This time I was grinding granulated sugar into powdered sugar. I was too slow, so she told me to go to the hanoot to buy a certain kind of sugar, which turned out to be powdered sugar. Why was I grinding sugar? Both are the same price, and available 10 steps from our door. We also made “slew”, a delicious, pasty treat made from baked flour, peanuts and I forget. Then, for breakfast/lunch we also had cake and cookies from the sisters. I had school all day, including our final Language Proficiency Interview by the top Moroccan in Peace Corps. He said I did well, and I even got my scenario question from the yellow pile. I explained that I still do not understand anybody, but he thinks I will advance quickly in my new site. I took him home and we arrived just in time for the holiday meal. It was nice because he will be alone in a hotel room for his holiday. I had been told it was a day of gift giving, but I did not see any. The next day, our class took a field trip to the souk in Imouzzier to buy our supplies to cook our families Thanksgiving dinners. I found enough to make a fair facsimile of a traditional meal. I started cleaning vegetables and doing what could be done in advance. Mama had told me to wait and buy the chickens in our town, but when I ventured out to do so, I met Mike and he had just been to every chicken store, to learn there was not a chicken to be had in our town. Fortunately, his brother offered to taxi back to the city and get our chickens. Nightfall was approaching and we are not allowed to travel. The day saved! Hasanna came over to say that dinner would be at her house. I reminded her that my cooking/holiday had been agreed over a week ago. Her husband does not feel like going out. I am sad because she has cooked so many meals for me, but so it goes. Thanksgiving Day was a tough one for me, finding my “resilience” very low. Class in the morning, more prepping at lunch. In the kitchen, as I was trying to explain to Mama why the day was important and compare it to her being alone in the US where no one knows Ramadan, far from your family. She was not interested in listening and that is when I started to cry. Then she took time to say she understood, and indeed she did. She and Papa both emphasized that they are my family and everyone would be there. In fact, rather than have two empty seats because Hasanna and her husband were not coming, they invited 6 to take their place. The estranged son, Tufick, his wife and two children live right here in town and they barely see one another. They came, along with the Uncle from Fes and one of the Aunts, Aisha. We began the dinner in the fashion of my friends and family, holding hands around the table, bowed heads, and I gave a prayer in English, with a rough Darija translation. This was my strongest attempt at sharing American culture. Despite all their attempts to get me to cook things differently, they ate everything. I roasted two chickens and a big pan of mixed potatoes, red and sweet, with onions, cubed with olive oil. I steamed green beans and put some cumin. I made a big fruit salad of grapes, red and yellow apples, pears, banana, fuyu persimmons, plums and strawberries, with tangerine juice and a smidge of sugar. I roasted slices of green apples with a little sugar and topped with roasted walnuts. I made a fair version of deviled eggs, with a home-made mayonnaise. Brown sugar, mayonnaise, cream, whipped cream, shortening for pie crust were not to be found. I cleaned up all the mess in time to speak with my sister, and all her family, in Texas, my step-brother in Florida, and I received a couple of calls from friends. During the day I delivered the Thanksgiving cards to each of the families that have hosted us here. I gave cards to the three houses of my family as well. Friday was a short day in class. The holiest day of the week is accompanied by a cous cous lunch in our home, as in most Moroccan homes. I started to pack. I don’t know how I am going to manage all this stuff, plus the other bag I will be getting back on Sunday. Saturday is our final full day here. I took pictures of the town and said good-bye to a few shop keepers and people I see regularly. We all spent the day preparing food for our Family Farewell Party. Our class group visited the Dar Shbaab to say our “thank yous” to Hannah, our PCV. I stayed for classes, hoping to say good-bye to my favorite youth, but none were in attendance today. I did see a few of them on the street. Our Party was attended my most of the women of the families, but none of the men. This was to be expected. There was a ton of lovely “kaskaroot” food, every kind of cake and bread, plus my fruit salad and Mike’s roasted veggies, tea and coffee. It was a great party and we all made little thank you speeches. The families received certificates and photos printed by Peace Corps. I spent the evening with my parents, and gave them little gifts, pot holders and a knife for Mama, prayer beads for Papa, group photos in a frame, for both. I am in my room and at 11 pm I just heard my 11-year-old nephew come in. Most mornings he is also the first person here. Not sure when he sleeps. 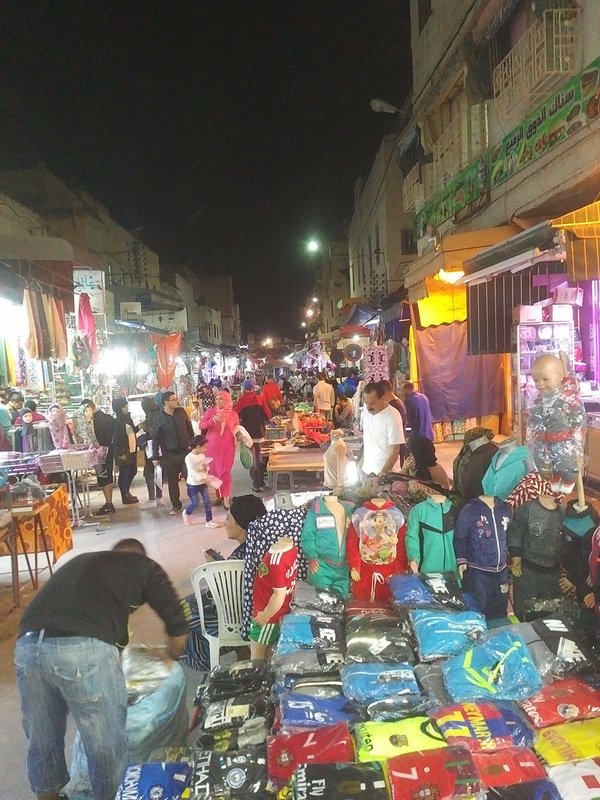 If anyone reading this knows a group that will sponsor a foreign exchange student from an out-of-the-way part of Morocco, he is a good candidate. I will miss them all. Tomorrow morning at 10:00, we depart for our training site. A tearful send-off is expected.